ProWarm electric underfloor heating mats offer a reliable, durable and effective underfloor heating system that is ideal for use under tiles. 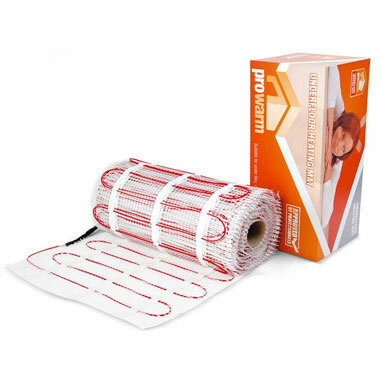 ProWarm 150w underfloor heating mats are suitable as a primary heating source, providing you use adequate insulation. They consist of a thin loose wire, which is evenly spaced and attached to a glass fibre mesh. This allows for fast and safe installation. ProWarm 150w underfloor heating mats are available in the following square metre sizes (please choose from the drop-down box above): 1M, 1.5M, 2M, 2.5M, 3M, 3.5M, 4M, 4.5M, 5M, 6M, 7M, 8M, 9M, 10M, 11M, 12M, 13M, 14M, 15M, 16M, 17M, 18M, 19M, 20M, 21M, 22M, 23M, 24M. The maximum mat size in one piece is 12m2 - anything larger is supplied as multiple mats. High quality EFTE advanced insulation system. Made with the highest quality Fluoropolymers and contains NO PVC coatings. Only 2mm thickness - one of the thinnest solutions on the market. Can be tiled straight over if required. Constructed using multi-strand wires, making them very tough. All Prowarm mats are 500mm wide. Under floor heating is a very cost-effective method of heating - providing heat where required and minimising heat loss. Prowarm CableSafe Warranty. Accidentally cut through your heating cable, and Prowarm will replace your cable free of charge. Please ensure all safety guidelines are followed during and after installation. Please note: Choose a mat size that will cover 90% of your floor area. It's better to order slightly less, as the mats CANNOT be cut to size. The product is supplied with detailed, full colour instructions for easy installation. You can also download a PDF document of the Prowarm underfloor heating installation instructions manual. A fibreglass mesh is used to ensure the desired heat output is acheived by spacing out the high quality cable at the correct distance. Installation is very easy as the mat is simply rolled out to cover the desired heating area. A series-type heating cable is used, with a twin conductor and a cold lead of 2m at one end. The resistance heating wire is enclosed in an initial fluoropolymer insulation layer, which is itself is wrapped in a protective metal shielding, before being encased in a final plastic outer sheath. The final diameter of the twin conductor cable is 3mm. The 'hot' and 'cold' lead junctions are uniquely designed to make them 'foolproof'. Meets all test requirements of IEC 60335 standard. Can be laid on any floor layout. Greater comfort due to uniform layout of heating cables and thermostat controlled temperature. Suitable for DIY as well as professional use - easy to install, clear instructions and professional technical support. A wide range of sizes, power outputs and options for most types of floor coverings are also available. FREE UK NEXT WORK DAY DELIVERY ON ALL ORDERS OVER £100 (EX VAT)! What Size Heating Mat Do I Need? the Total Floor Space of the room. You should then work out the area of Free Floor Space in m2 by accounting for any permanent fixtures or fittings in the room (e.g. bath, toilet). Remove 10% from this figure and use this to place your order. You should cover 80- 95% of the free floor space available. Anything less than this will lead to patches of cold spots. How Many Insulation Boards Do I Need? Each ProWarm insulation board is 1200 x 600mm and covers a total area of 0.72m2. For a free floor space of 9m2, you would need 13 ProWarm insulation boards.